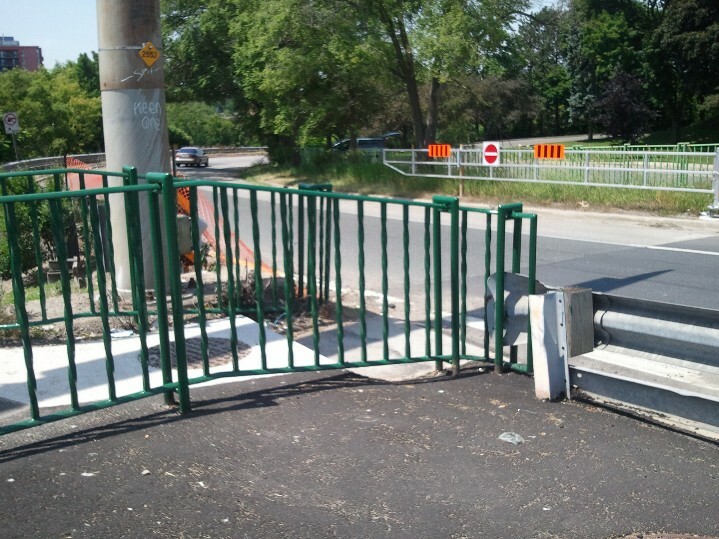 Hamilton has a policy and culture of avoiding uncontrolled crossings on major roads. There's usually a stop sign or a traffic signal somewhere nearby to allow you to cross. This isn't always the case, but usually the planners give us some kind of controlled crossing to get where we're going, although we might have to go out of the way to find it. The biggest exception I notice is the on-ramps and off-ramps for Hwy 403 at King or Main near Dundurn. There is no crosswalk, no light, no stop sign, nothing - and no alternative, either; you can't go some other way around to find a pedestrian-friendly stop-light. We're just expected to wait for the gap. 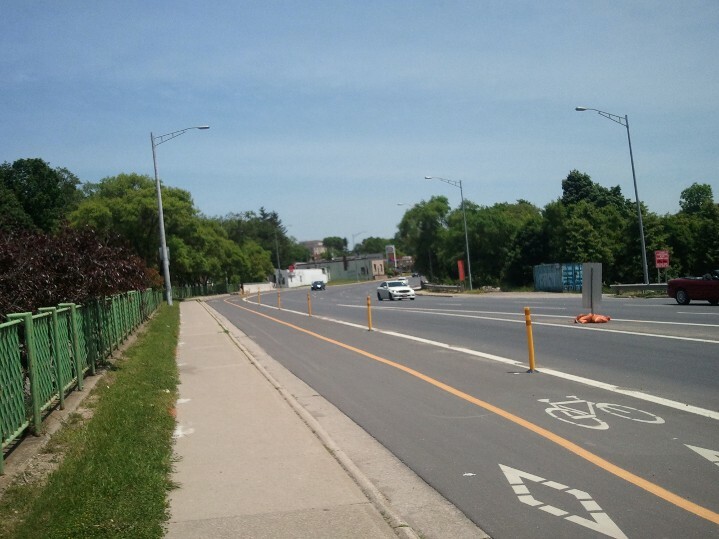 In my favourite case, the Eastbound on-ramp from King Street, the presence of a gap depends on the fickle lane-changes of high-speed oncoming traffic. Is that car in the distance coming down the on-ramp or not? I can't tell, can you? Sure it's far away, but the speed limit here is 60 km/h so it's probably doing 70. Want to bet your life that you can beat it across? No curb, no bollards, no water-barrels, just some knock-down sticks in front of knock-down people. Wait there for a gap. I don't have to repeat the statistics about how much damage a car going over 60 km/h does to a person, I'm sure you've all read them. I'm not picky. Just do something. Anything. A yield-to-pedestrians sign, like at the on-ramp in front of Columbia International College. A pedestrian crossover (PXO). A push-button stop-light (one would be nice on the other side too, so we could get to Fortino's Plaza without doing three cycles of the King and Dundurn lights). Replace the stairs with a ramp and some kind of bump-out/bollard thing. Martin Zarate is a software developer who lives in Westdale with his wife and three children. ... andthis was deliberated on for months if not years, and the bridge altered recently at considerable expense. Yeah, I should've kicked up a fuss before they did all that work, I know. I just kind of assumed since they were doing so much work (including a temporary asphalt ramp being added to those stairs) that they were going to do something with this. edit: for the dead end, is there a sign or anything warning you that it ends? I mean, I've always lived here so I've always known you can't go that way... but that's a danged long backtrack to get back to Dundurn, cross three cycles, and then start out on the correct side of the road. Not faulting you. Shaking my head at the process. I recall the ramp as well.... doesn't help the City's case for mere thoughtlessness. AFAIK, there's no warning for the dead-end. 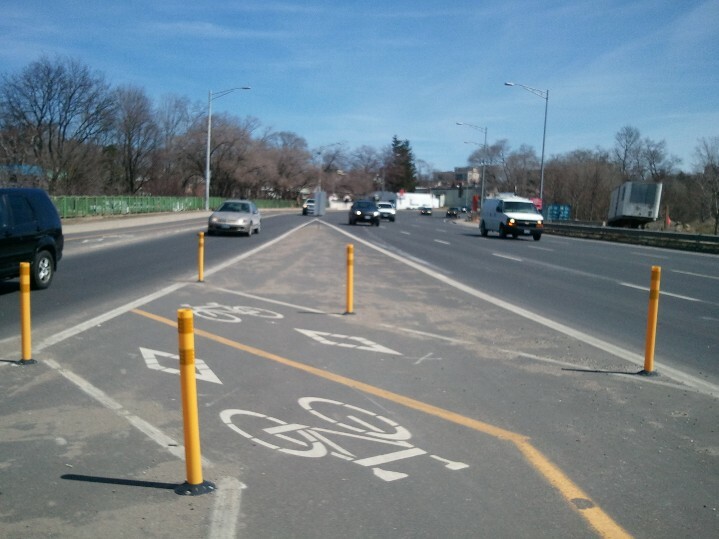 On a related note, McHattie said he would install Bollard at the end of July around the 2-way bike lanes on Main West after a speeding Honda Civic used the bike lanes (with me in them) to pass the cars in the *actual* right hand lane. It's now Sept, and the Bollard hasn't gone up. For the record, I wasn't hit. People rarely go 70 into the tight onramp bend onto highway 403. Speeds of 50-60 are much more common. No chance. Anytime I drive this stretch I'm the slowest driver by a mile. And whenever I look down at my speed, I'm around 60k. It's a full fledged freeway. I would say, on the basis of cycling there during the morning rush hour, that speeds are certainly in excess of 50km/h, and motorists tend to accelerate as they approach the ramp. But the main problem is that many motorists change into the curb lane at the last minute without signaling so you can't predict in advance which cars are going to turn off. That, combined with the high speed and poor visibility because of the turn (cars are coming directly behind you when going west) makes it quite tricky. The solution here is not rocket science. It's a full intersection with lights, where drivers on King can turn onto the highway ramps when they have a green. When they have a red, pedestrians can cross the entire street, or continue in the direction they were going. While we're at it, King should be two way through westdale to dundurn (and, frankly, beyond). We also don't need a highway ramp at paradise. The entire system is hugely overbuilt and completely economically un-viable. We are one of the only cities in Ontario with highway accesses that intersect our city streets as ramps instead of intersections. This is not cheap infrastructure. A valid point, but after just rebuilding the bridge it will be decades before we see that kind of work, even if Council/Public Works is convinced that it's a good idea. Putting a "yield to pedestrians" sign is a perfectly normal solution to a pedestrian crossing on a slip ramp. They exist elsewhere, both in Hamilton and other cities. And it's a solution they could do right now. Just send over a guy with a sign and some bolts today, we could see it up before our commute home. If you want to be really fancy, add some blinking lights to the sign (again, like they do in other cities). The problem with that is I bet that drivers won't be too inclined to follow it. The one at Columbia International College on Main in Westdale seems generally effective. I'm sure there are more than a few scofflaws, but the fast majority of the time I see traffic wait patiently for the gaggles of students crossing there. However, there's an obvious difference in that traffic moving far slower at CIC's ramp. It'd be hilarious if there wasn't an inevitable tragedy - but all this within about 3 km's or so of, about 25,000 students. I'm always blown away by Jerseyville road in Ancaster. A fairly busy 'burb road, with a visual obstructing hill, that divides a 2-rink Community Centre, about 25 soccer fields, a swimming pool and a highschool....yet, nary a crosswalk to be seen. Luckily, it's only 2 lanes of Frogger-ing your way across. McHattie's participatory budget E-vote is online at http://forward1.ca/ - there is an entry for "Main/Dundurn and King/Dundurn: pedestrianize intersections" in the vote. This is the only entry that corresponds to this particular request. That one got my "#1" top priority vote. If you feel the same, do so.